Corporate Management is a license that provides governance and analytics for your organization's overall corporate use of Elements.cloud. 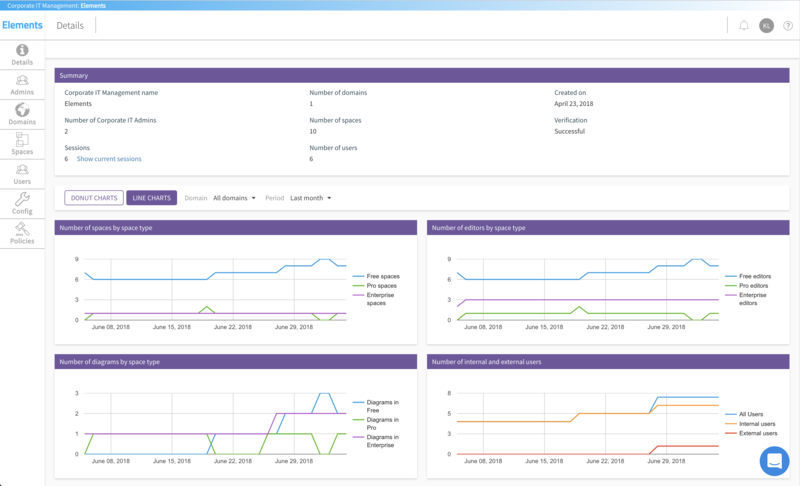 It supports oversight and management of all users and provides visibility of all Spaces in your domain(s). It does not give visibility to the content within those Spaces: requirements, process maps, Org Models. 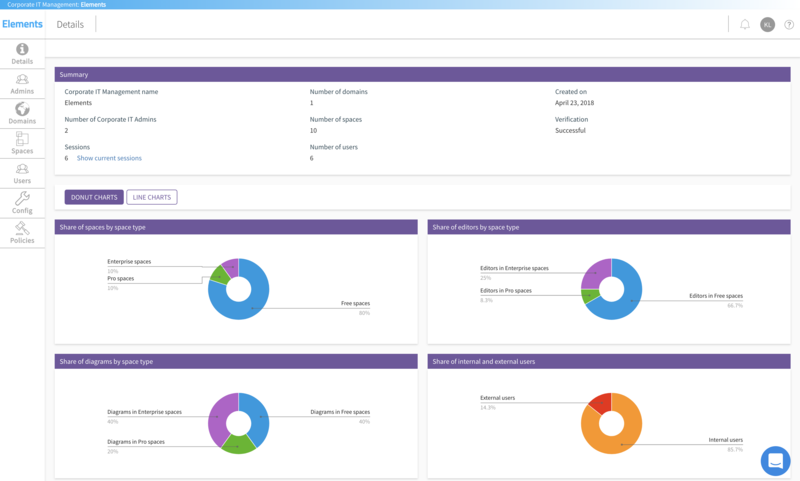 Corporate Management is a separate license and is charged based on the number of users across all domains that are connected to the account. You can have unlimited Corporate Management Admin users. Those users do not have any ability to create content. The license is completely separate from the Free, Pro, and Enterprise Editor and Viewer licenses that are needed to create, collaborate on, and view content. Contact success@elements.cloud to switch on Corporate Management. For more pricing info click here. You need to be able to validate your ownership of a domain to be able to manage users and spaces across a domain. There is a simple process to add and validate your domain. Here is the support page for setting up and connecting domains. You can display this data for all verified domains together or by each verified domain individually. You can also switch to historical line graphs and see the same data as it changed through time (filters: one month, three months, six months). 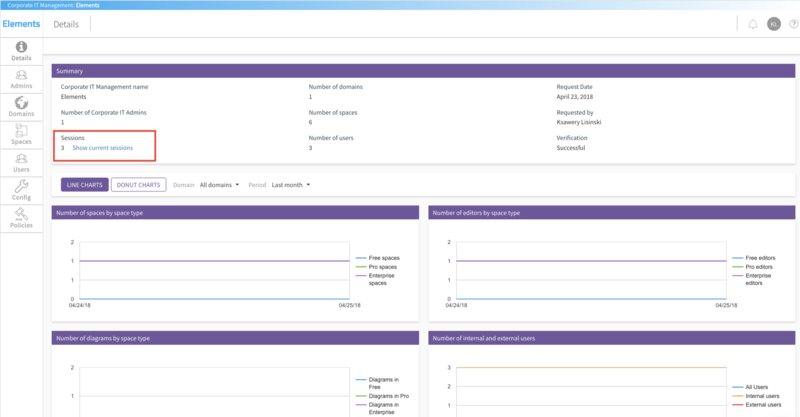 Corporate Management allows you to see all spaces associated with your verified domains. This allows you to see how many users, editors and external users are in each space and filter your spaces by license type. It does not allow the Corporate Management Admin to invite users to the Space or see any content within the Space but it does allow to delete spaces. You can view all users associated with your verified domains using Corporate Management. 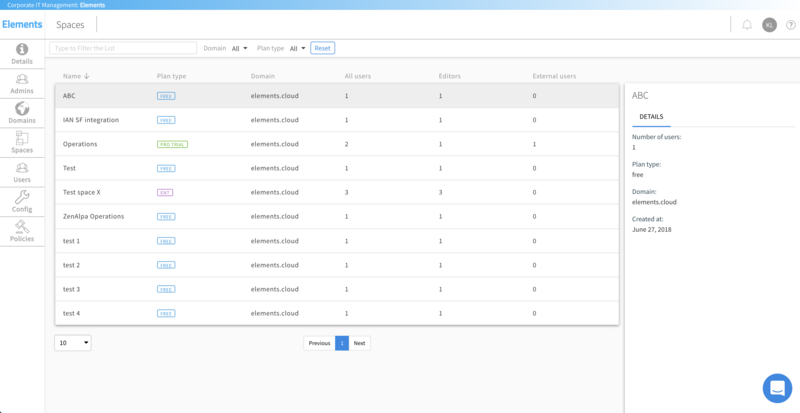 You can see all spaces the user is a member of, what role they have in each one, filter the list by specific domains, spaces, or display only Space Admins. Corporate Admins can also delete users (which removes them from the system and terminates their accounts) or disable them (which blocks them from accessing Elements again). You can also view the list of all external users who have access to your content. When deleting a user account the Corporate Admin can decide which other user will take ownership of the deleted user's content. A Corporate Management Admin user can view and manage all active user sessions in your organisation's domains. You can see the number of currently active user sessions on the Corporate Management homepage. Corporate Admins can additionally click on the selected text to display the list of all current user sessions with detailed data (username, IP address, device, browser). "Time To Live" : allows you to set the number of minutes of inactivity before a user is automatically logged out. “Corporate Management is only accessible by Corporate Admins” : this is turned on by default. You can make Corporate Management viewable by all corporate users - this does not grant them any admin rights. “Can't invite or share with external users” : If this is turned on then users who are not members of your domain cannot be invited to organization's spaces or have content from those spaces shared with them. This does not affect external users who are already members of your spaces. “Can't copy content outside of the company spaces” : If this is turned on then users cannot copy content to spaces that do not belong to your organization, i.e. have different domains. Within the "Corporate Window" - click on "Spaces" in the left panel. 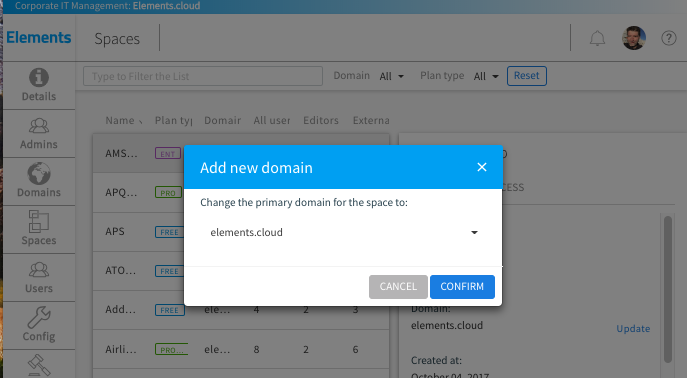 Select the space where you want to update the primary domain. In the right panel click on the blue "update" next to Primary Domain. 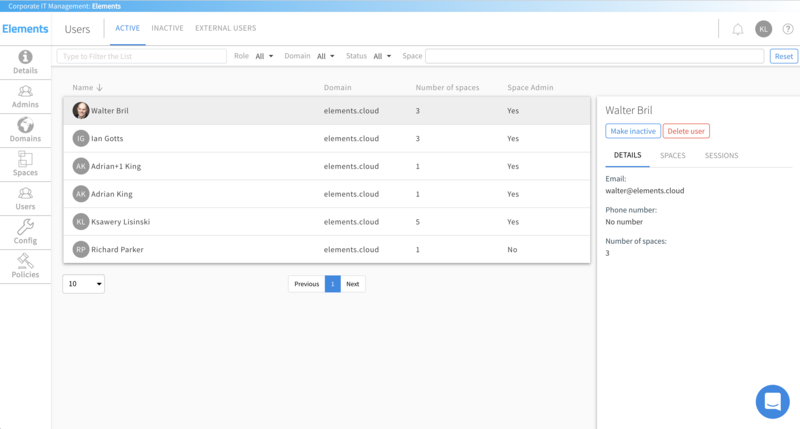 You will be able to select the domain of the users who are current space admins on this domain. So if it is a domain that you do not control within the Corporate Admin registered domains, on changing to that domain - the visibility of the space (and control of the space) will be lost from Corporate Management.